Mobility freedom with the Go Go Ultra X 3 Wheel Travel Pride Mobility Scooter! Suitable for both indoor and outdoor use, the Go Go Ultra X Mobility Scooter offers speeds up to 4 mph and a distance range up to 7 miles on a single charge. With its 3-wheel design, the Go Go Ultra X has a shorter (33”) turning radius compared to 4-wheel scooters, making it ideal for navigating tighter spaces. The controls on the Go Go Ultra X 3-Wheel Travel Pride Mobility Scooter are straightforward and easy to use, with a simple dial knob to control speed, right lever for forward and left lever for reverse motion, and regenerative and electromechanical brakes. For a comfort fit, the Go Go Ultra X Mobility Scooter’s 17” wide seat is height adjustable and the tiller can be angled for easy reach of the controls. 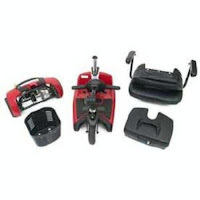 The seat swivels for easy getting on and off and the armrests can be flipped up for easy access. 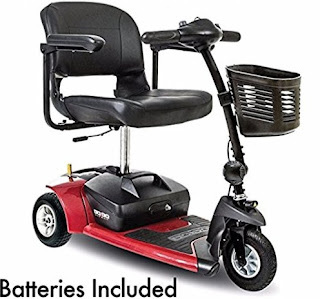 The Go Go Ultra X 3-Wheel Pride Mobility Scooter is supplied with a drop-in battery box with 2x 12AH sealed lead acid batteries and a 2A Offboard charger. Batteries can be charged on or off the scooter for convenience. The Go Go Ultra X 3-Wheel Pride Mobility Scooter is cleverly designed so that it can easily be disassembled into 5 manageable pieces and features an innovative locking mechanism for simple 1-handed frame disassembly - ideal for transporting in a vehicle to take it with you wherever you need to go. Additional features of the Go Go Ultra X 3-Wheel Travel Pride Mobility Scooter include flat-free 8x2” front and 8x2.5” rear wheels, 24V DC motor, 6 degree climbing angle, 2.25” ground clearance at mid-frame (1.25” at motor), freewheel capability, front-mounted plastic carry basket, and 260 lb user weight capacity.